Mount Allison experienced a significant decline in first-year enrolment this year according to the university’s vice president of finance. 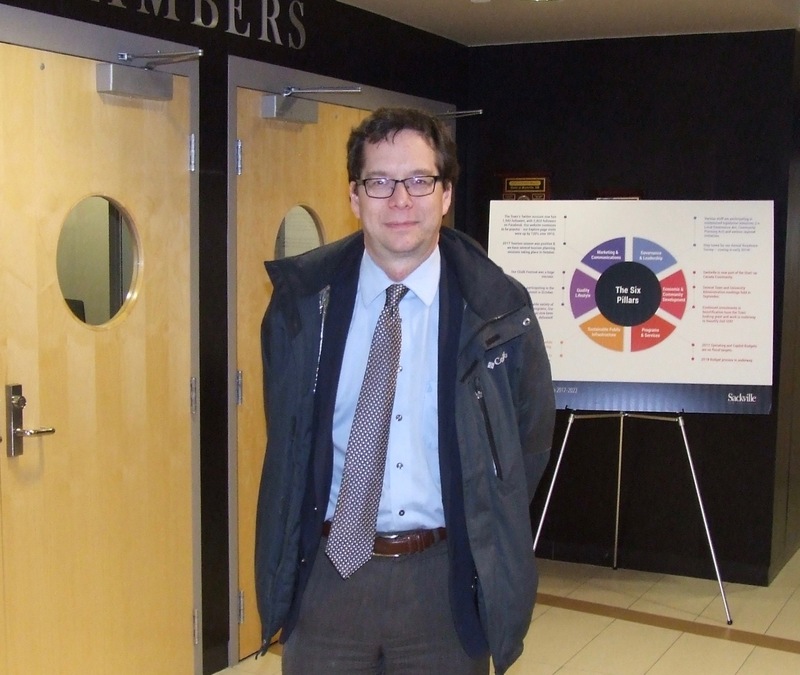 Robert Inglis told Sackville town councillors Monday night that Mt. A. had planned to attract 700 new students this fall, but as of October 1st, only 600 had enrolled in their first year compared with 641 last fall. “This results in a shortfall in our revenue,” Inglis said, adding that the university will use its financial reserves to make up the difference this year and has already stepped up its recruitment efforts for next year. “We’re hopeful that, that 600 entering class can be increased to a more traditional level, say around 650 or so,” Inglis said. Figures released by the Association of Atlantic Universities show that as of October 1, Mount Allison had a total enrollment of 2,180 full-time students, 70 fewer than last fall and an overall decline of 3.1 per cent, the steepest in New Brunswick. St. Thomas University in Fredericton experienced an enrolment decline of 0.9 per cent, while the University of New Brunswick and Université de Moncton had slight increases. To view figures for all 16 public universities in Atlantic Canada, click here. Enrolment declines can have a significant impact on university operating budgets because revenues from student tuition and other fees often exceed government grants. At Mount Allison, for example, government grants totalled just over $25 million in the last fiscal year while revenues from students came to more than $30.5 million. To view the university’s latest consolidated financial statements, click here. During his presentation at last night’s town council meeting, Robert Inglis outlined three large renovation projects that could also attract more students to Mt. A. He said exterior work should be completed this winter followed by interior renovations to convert the former fine arts building on York Street into a research and learning centre focussing on so-called WET sciences such as biology and environmental studies. Inglis said the 50-year-old chemistry building is undergoing major upgrades, while Windsor Hall, the university’s largest student residence, will be closed in May for a complete refurbishment that will include summer conference facilities and a first-floor multi-purpose room. Ron Outerbridge, chair of the search committee, sent an e-mail to Mt. A. students, faculty and staff last month reporting progress. The Mount Allison Board of Regents is expected to appoint the new university president at its next scheduled meeting in February. This entry was posted in Mount Allison University and tagged Association of Atlantic Universities, Robert Inglis. Bookmark the permalink. I wonder if the decline is specific to this university, or if the decline is specific to the programmes offered at MtA. For example, perhaps would-be students have realised that there is no future in having a degree in “Gender Studies” and the like, and are going for programmes that lead to a future. MtA is a bit heavy on “no future” majors. I unfortunately don’t have data to make such an analysis, but I’m sure that the Administration will, if they haven’t already, because the situation is clearly critical. At this rate of decline, it won’t be long before drastic action becomes necessary. Declining Enrollments at Mount Allison University. Why Liberal Arts Universities in Canada like Mount Allison University have Now Passed the Point of No Return. Mount Allison University and the majority of universities have gotten wrong and what they don’t understand. Or perhaps in just plain old denial. Pumping out too many Liberal Arts Degrees. “while college tuition payments are rising, the supply of college graduates in many fields of study is exceeding the demand for their skills, which aggravates graduate unemployment and underemployment, which in turn increases the burden of student loan defaults on financial institutions and taxpayers.” Wikipedia as result, liberal arts degrees hold no real value. Canada and Undergrads e.g. Liberal Arts Degrees Economic Value a Ticket to Poverty? “We are number one when it comes to university and college enrollments, but we are also number one in the number of people with university degrees that live in poverty,” said Benjamin Tal, deputy chief economist with CIBC World Markets. Liberal Arts Degrees not Valued by Employers. “One survey question asked hiring managers what degrees they preferred. Only 1.6% said liberal arts. “Forbes New Study Is No Degree Better Than A Liberal Arts Degree? Liberal Arts Degrees Skipping the Basics. No more core curriculum at liberal arts universities for the most part. Every university in the liberals arts should have a ‘Foundation Year’. Liberals arts degrees are nothing more than a hodgepodge of useless microaggressions served up buffet style these days. Universities/Liberal Arts Programmes Not Acknowledging New Models of Education & Disruptive Innovation. Universities now no longer have Proprietary Ownership of knowledge & Distribution. Big problems. The internet/massive open online course Massive Open Online Course (MOOC’s) are just a buffet of information. Well so is a liberals art degree at this point as well. Except for an internet connection and MOOC’s lot cheaper than the cost of a liberal arts degree. To be fair MOOC’s with the help with places like Google and best of the best universities in the World like Massachusetts Institute of Technology (MIT) are starting to get good really really good in their consistency and great price points also open 24/7. So Canadian History #101 brought to by Google University which is basically already here will be far more valued. Let’s face it if one gets a History degree from MTA and from the University of Saskatchewan it is all over the map. Universities for the more part have totally gotten rid of core curriculum standards e.g. core readings altogether. BIG MISTAKE. But Google GETS IT! Brick and mortar universities are simply too expensive vs. online education degrees, especially liberal arts degrees where one does not need for example a lab .This also beats the crap out having to move somewhere else and be in a cramped classroom. Career Services at University are a JOKE & Out Dated ! If your university does not make Career Services, Internships as part of their core budget and is not part of their main mission statement. Find a university that does! Career Services not part of MTA core budget. Only 17 percent of recent graduates say career centers are ‘very helpful. The Best People not being Hired also a Big Problem at Universities e.g. Collective Agreements. ‘Collective Agreements’ and how they work and why the best people many times do not get the position they deserve. This means a lot of times people get promoted even though it not in the public best interest. Though it is the public paying for these salaries. There no such thing as Collective Agreement online, meaning the student shop around for the best course and degrees taught by the best people in that field. Atlantic Canada also has way too many duplications of programmes for an area with such a small population. A New Generation at Universities. The new generation going to universities now is Generation Z. Generation Z is the new generation and has replaced Millennials as students in universities. Generation Z born are Generation Z (1995–2009) very different than Millennials they are perfectly fine with credits and degrees online. They grow up their entire lives with the internet. Every generation before has seen the traditional liberal arts degree as means of upward mobility except for this new generation, Generation Z. Generation Z prefer – On-Demand Learning/Apprenticeships vs Formally Educated methods. Universities are now one of the most Closed Minded places in the Country. Universities and Safe Spaces/Trigger Warnings. The concept of Safe Spaces is to protect students from ideas they might find offensive. The whole idea of going to university is the opposite it about hearing idea’s that you might find upsetting and challenges you. It’s not about living in an ‘Echo Chamber’. Why Space Spaces & Trigger Warnings are a Bad Ideas. “John Ellison, Dean of Students at the University of Chicago, wrote a letter to incoming students. In this letter he states, “we do not support so-called trigger warnings, we do not cancel invited speakers because their topics might prove controversial and we do not condone the creation of intellectual safe spaces where individuals can retreat from ideas and perspectives at odds with their own.” This view is also shared by Pres. Obama. Student Debt is Not Worth it for Liberal Arts Degree Now. The debt load people with degrees do make more than those who don’t. Though it depends on the degree. What happens in a lot of cases someone gets liberal arts degree can’t get a job and pay off the student loan at the same time then they decide to upgrade their education to something completely different than their liberal arts degree maybe something like healthcare and that point they get a better job. Though in fact did not need undergrad at all to take their upgrade. The only their undergrad did is ruin their credit and make it impossible to buy a house and car etc… It, in fact, that liberals arts degree did the complete opposite of what a liberal arts degree did in the past and that is upward mobility. Let’s Go Over the List Why Liberal Arts Degree and Four Year Programme is Now a Thing of the Past. The Liberal Arts Degree List ! Liberal Arts Degree, Gone – Core Knowledge. Liberal Arts Degree, Gone – Upward Mobility. Liberal Arts Degree, Gone – Liberal Arts Degrees no longer being viewed as Unique too many being Pumped Out. Liberal Arts Degree, Gone – Being open to new Ideas e.g. Safe Spaces & Trigger Warnings. Liberal Arts Degree, Gone – No Perceived Value, especially by Generation Z and now the general public and employers. Now that the public has decided Liberal Arts Degree has No Perceived Value the End is Already Here and Everyone Knows It !!! For Mount Allison University to survive the College/Univesity Bubble in the near future, it will probably have to be amalgamated with a bigger post-secondary institution to survive. Welcome to Mount Allison the campus of university X.
Demian Hammock, Diploma of Advanced Studies Human Resources Management. The illiterate rant above show exactly why a quality Liberal Arts education is valuable. This person could not get hired because he is unable to make a coherent argument or write using basic English syntax. Undergraduate degrees are required before going on to graduate studies. Many students achieve better results in a smaller, more intimate learning environment, in contact with professors. For this reason universities will still attract students, but worryingly, only those of means to afford it. I agree that low income students cannot afford this kind of program. Even if every single student in Canada got a STEM undergraduate degree, the job market would not magically transform to welcome them. Your spelling and grammar may be perfect, and his may not be, but if you read the content, you’ll see that it is much more thought-provoking and deep than your own comment. To each his strengths. I see no reason for you to insult Mr Hammock because his lie on a different plane to yours. *This person could not get hired because he is unable to make a coherent argument or write using basic English syntax*. Thank you for the kind words, Rima and Louis. I don’t need or want an apology from Leigh Fisher. I don’t need a ‘Save Space’ from people like this. It is better to let them speak freely. When someone mocks someone else’s intelligence there is usually something lacking in them e.g. Interpersonal skills etc…People that lack interpersonal skills attack first. It is like when Clover the Dog hears someone at the door her first reaction is to attack that person for coming into her ‘Save Space’. I would not ask for an apology from Clover the Dog when she attacks first and won’t of Leigh Fisher either. This individual seems to suffer from is generally termed e.g. The Grammer Nazi’s Syndrome. Grammer Nazi’s have a perceived fallacy of authorities over others that they simply don’t have. I don’t know this person from a hole in the ground. So being a Grammer Nazi is the sort of thing people do to make oneself feel better and to justify their mediocrity. It is just better just brush folks like this off life is too short. so thank you both for doing so. Food for thought, Demian. Thank you for this. Thanks, Rima and Merry Christmas and a Happy New Year to one and all !